1Preheat the oven to 450?F. 2Spread the tomatoes out in a single layer on a rimmed baking sheet lined with parchment or foil; drizzle with oil and sprinkle with salt and pepper. Roast for 20-30 minutes, until soft and starting to turn golden. 3In a medium pot set over medium-high heat, heat another drizzle of oil along with the butter and sauté the onion for 3-4 minutes, until soft. Add the garlic and thyme and cook for another minute. Add the roasted and canned tomatoes along with the chicken stock. Bring to a simmer and let cook for 20 minutes, or until the tomatoes are very soft. 4Remove from the heat, add the cream and purée with a hand-held immersion blender in the pot. (Alternatively, carefully transfer to a blender to purée until smooth.) Season with salt and pepper and divide between oven-proof bowls or ramekins set on a rimmed baking sheet. 5Toast the bread - if it's thick, it's easy to do in the preheated oven. Butter it if you like, and sprinkle generously with cheese. 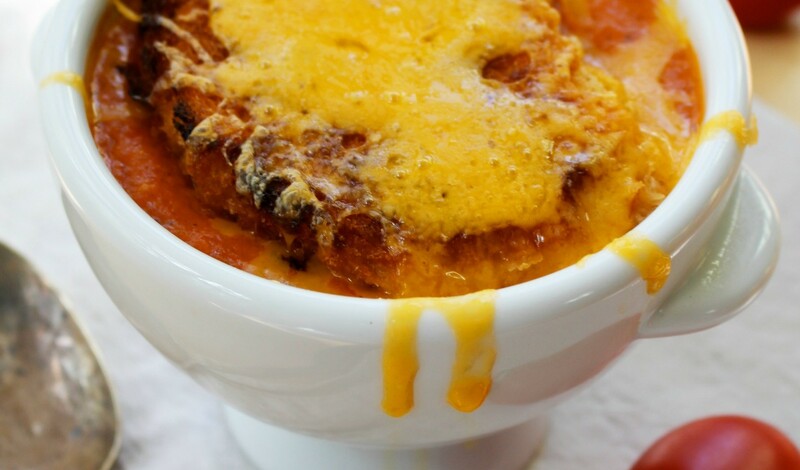 Float a cheese toast atop each soup and place in the oven for 5 minutes, or until bubbly and golden. (If you like, turn on the broiler for a minute or two to speed up the process.) Serves 6.